Spicing it up in the kitchen! Grease and lightly flour a 10 inch fluted tube pa (bundt). In a large mixer bowl combine cake mix, pudding mix, oil, eggs & water. Beat at low speed of electric mixer till combined, then at medium speed for 2 minutes. Reserve 1 1/2 cups of batter. Turn remaining batter into pan. Stir together reserved batter and the chocolate syrup. Pour chocolate mixture atop butterscotch batter. Swirl with a metal spatula or spoon to marble. Bake at 350 about 60 minutes or till done. Cool 15 minutes on a wire rack. Invert onto rack; remove pan. Cool. Glaze with Chocolate Icing. (I just used a high quality chocolate fudge sauce this time). Enjoy! In a small saucepan melt together chocolate and butter over low heat. Remove from heat; stir in powdered sugar and 3 T hot water. Add more hot water, if needed, to make of pouring consistency. Spoon over cake. This recipe is from my ancient copy of the Better Homes and Gardens "New Cook Book" that I've been using since I was in high school. Its tattered and has loose pages, but its served me well and I use it all the time. My mom, rest her soul, had an even older, worn copy of it that I am hoping my dad will give to me someday!! It feels so heartwarming that my daughter wanted a home cooked meal for her 14th birthday! As she requested, I made pigs in a blanket, corned beef & cabbage, & a butterscotch marble bundt cake for her tonight. It is rare that I "allow" my husband to cook, but tonight he smoked a beautiful brisket. 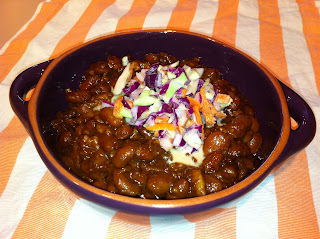 I made some delicious cole slaw and for the first time ever, Boston baked beans from scratch. We decided to check out the new Avatar's Punjabi Burrito in Larkspur today. The Jerk Chicken Burrito and the Rock Shrimp with Chutney was different, yet delicious! After a long 10 days of being in and out of the hospital, we unexpectedly had to put our dog to sleep last night. I miss her so much and I'm just too sad to even think about food, cooking, or blogging. I'm taking a food blogging/cookbook writing class! My first homework assignment is to write 5 blog posts with only 2 sentences each. I'm having a serious case of writers block. I bought these red chief lentils a few weeks ago and have been dying to try the recipe on the back of the bag. I love this soup! Its sooooo good. Not too spicy, easy to make, and filling. 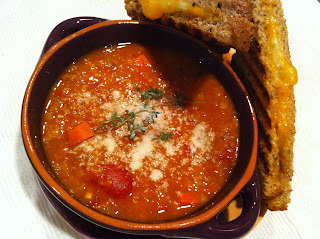 I served it with some grilled jack and cheddar on whole grain bread. A perfect cold, Fall dinner! My tennis friend, M.O.G., is having a CAbi party next week and she wants me to cater it! :) I have a pretty small budget to work with, but I think I can swing it! I've never really been interested in having a catering business before, but this could be fun. I certainly wouldn't mind doing the occasional small party or even a small dinner party, once in awhile. So, we'll see how this goes. I have a few great ideas. Now I just need to go shopping for some new serving dishes, etc. I want everything to look really nice. I'll be sure to post pictures! Hi and welcome to by blog. My name is Shelley and I live in Marin County, CA. I became interested in cooking when I was 9 years old and am still passionate about creating new recipes for friends and family. I would just love to see more people preparing home cooked meals and actually enjoying it.